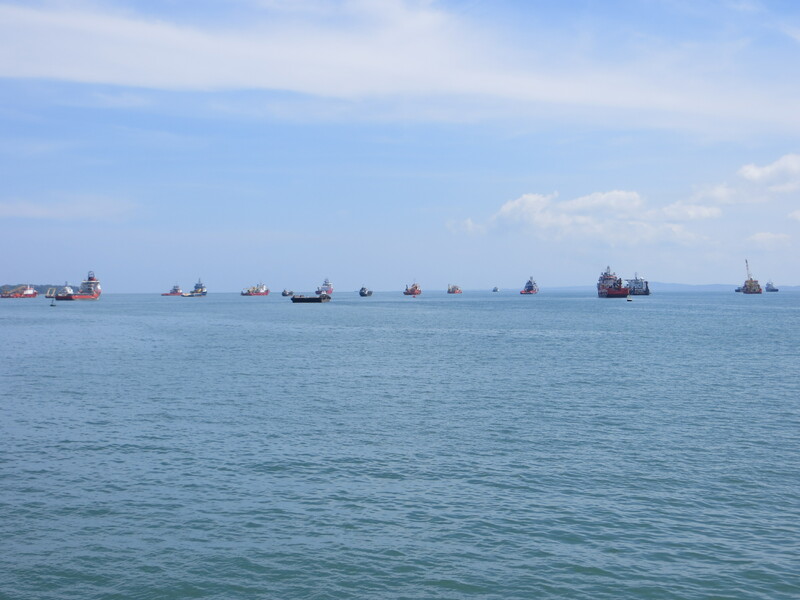 After two days in Brunei, it was back to civilization; we sailed to Kota Kinabalu, on the north coast of Borneo in the Malaysian state of Sabah. 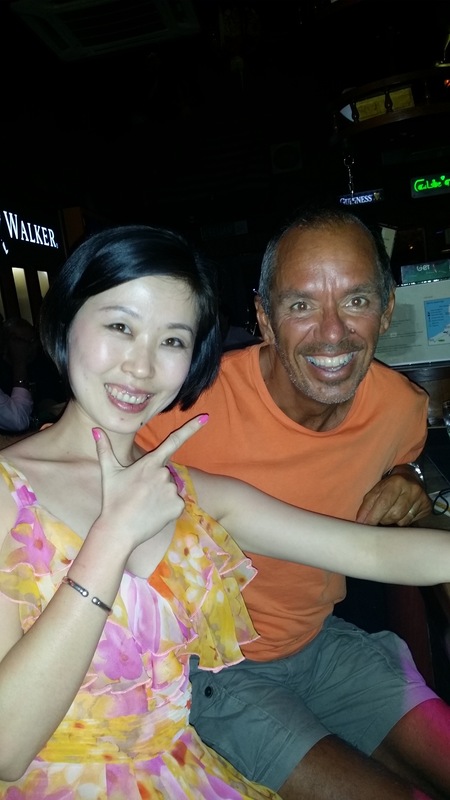 There’s plenty to like here: great views of the South China Sea, some nightlife, and markets. 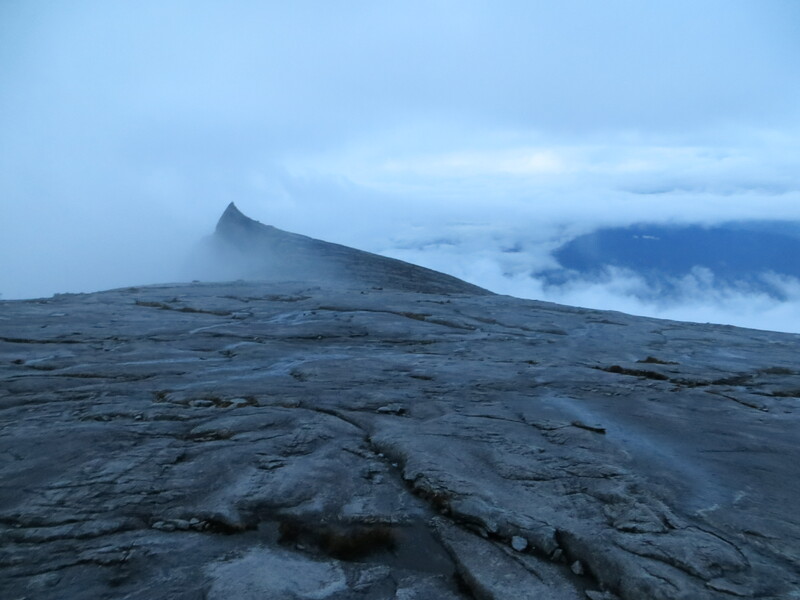 But mostly it was about climbing Mount Kinabalu which, at 13,435 feet, is the highest peak on Borneo and was Malaysia’s first UNESCO World Heritage Site. We went to a bar our first night with a fun live band and sat next to this cute Chinese woman and her husband/boyfriend. The crazy thing about chatting with them was that they’re from Dalian. Never heard of it? Neither had we, yet it’s a city of 6.1 million people, bigger than any U.S. city except New York. That’s China! 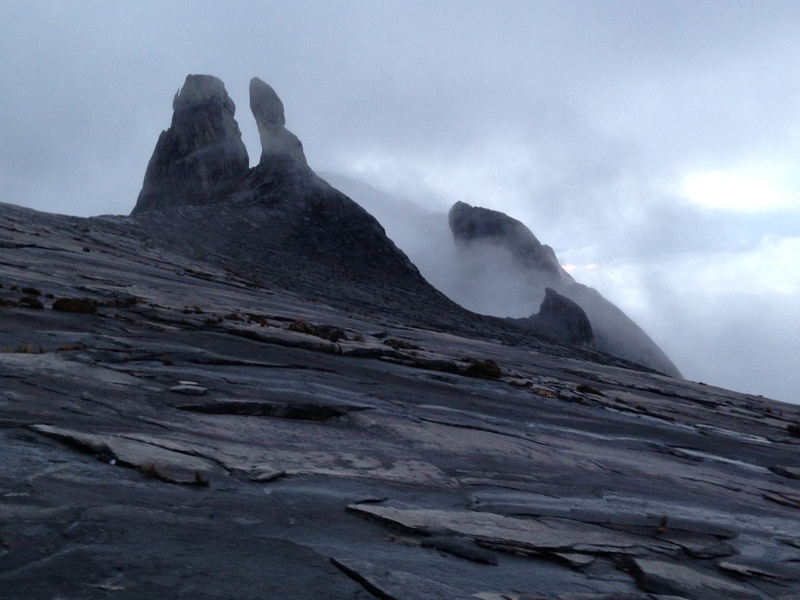 Kinabalu is one of those reasonably high peaks that doesn’t require any specialized mountain climbing gear or experience; it’s just a long, steep climb. Typically you climb it in two stages. 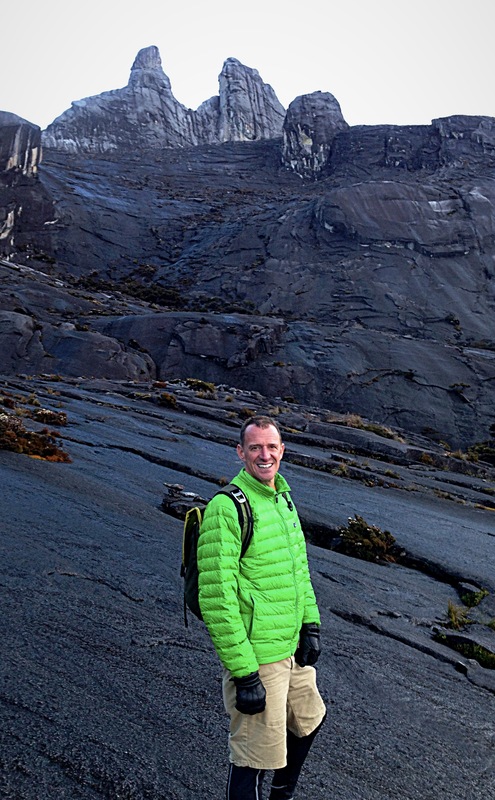 On day one you start at the park headquarters at 6,122 feet and climb six kilometers to a “lodge” at 10,730 feet. The next day you finish the climb up by going another 2.7 kilometers to the peak at 13,435 feet and then go all the way back to the park headquarters. In other words on the first day you climb 4,608 feet or nearly nine-tenths of a mile and the next day you go another 2,705 feet up and then the full 7,313 feet down. Here’s the little secret of hikes like this: going down may be harder than going up. Going up isn’t easy by any stretch; it was a really tough climb. But going down was brutal, using leg muscles that you just really don’t use much. And going down over 7,300 feet in one morning was brutal. We’re bushed. One peculiarity of the climb. They say the best time to get to the peak is at sunrise. So we were up at 2:00 AM (seriously) and after breakfast were on the trail by 3:00 AM. 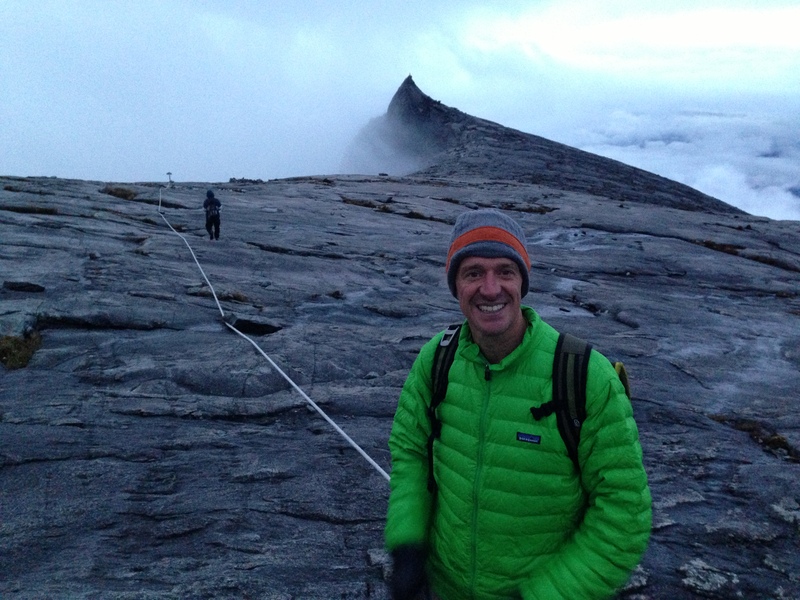 It took a little over two hours to get to the peak, all in pitch darkness, using headlamps like miners to find the way. Once we got there is was bitter cold and still dark but … it was pretty obvious that with that much fog we weren’t going to see a damned thing. So we waited until 5:45, when the sun was officially up, and headed back down. Oh, you want to know how the lodge accommodations were for our abbreviated night’s sleep? Pretty basic. OK, really basic. A four-person dorm room with shared cold-water bathroom down the hall. 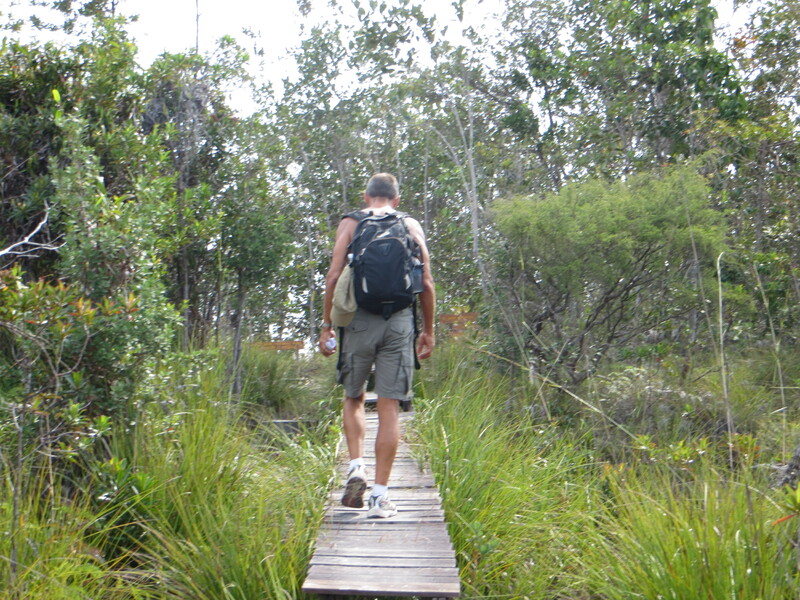 And when Mark went to get something out of his knapsack that he’d set by the bed a cute little rat jumped out, having discovered his bag of cashews for the trail. Made for a great night’s sleep! Still, there was some real beauty on the trail. Tomorrow we fly to Bali to spend the next six-plus weeks in Indonesia, meeting our old neighbors Bart & Ann & Wil at the end of that time. 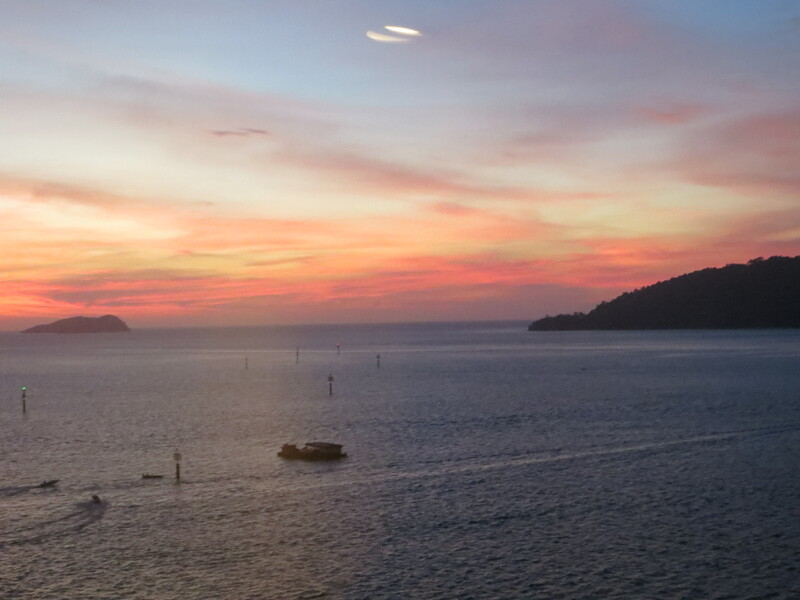 Here, then, are our last pictures from Borneo. A view from relatively near the start of the climb. It would be the last clear view we would have. This was daybreak after we’d started the descent. The landscape up there was surreal. 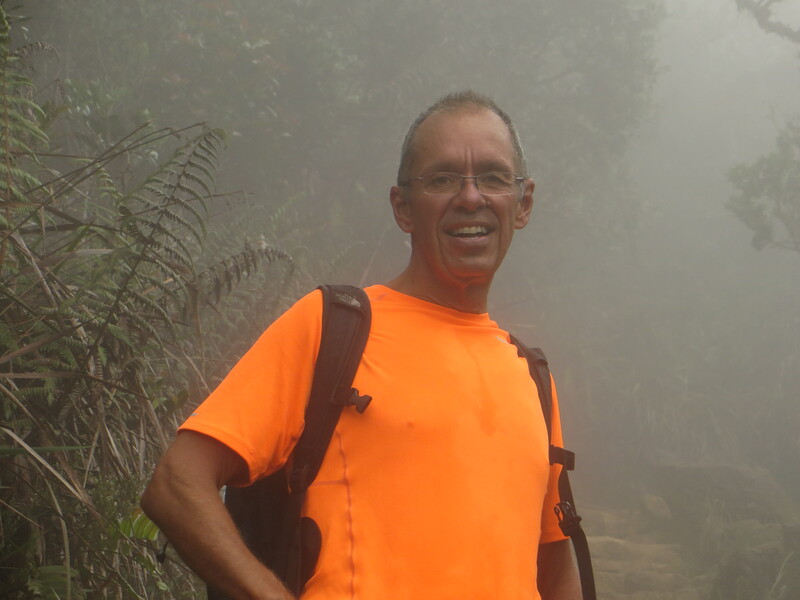 Mark near the peak. The hat and gloves and winter coat were needed. In fact, we needed more! 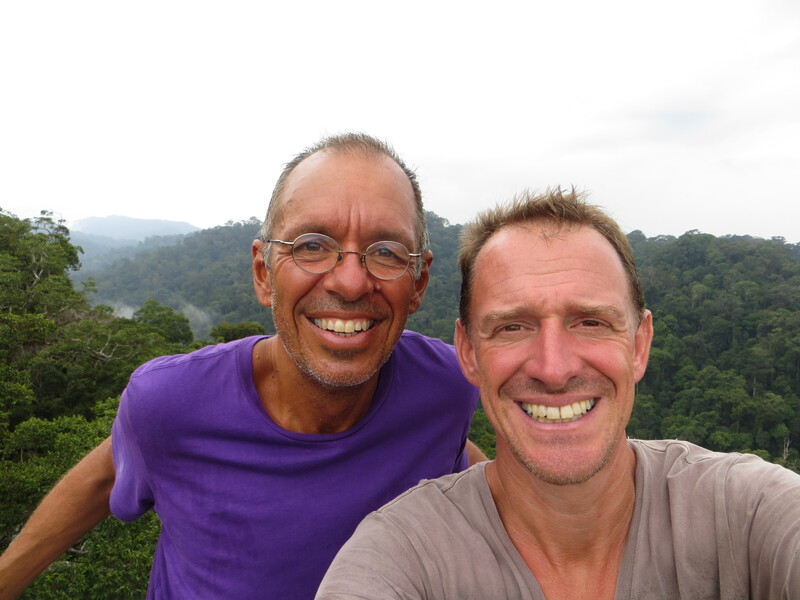 Brunei is the 22nd country we’ve visited on this adventure, a little country (400,000 people) with a big name (officially it’s “Nation of Brunei, Abode of Peace). It’s also a rich country, thanks to abundant oil and natural gas reserves; the International Monetary Fund ranks Brunei the fifth richest country in the world based on per capita GDP, and considers it a developed country. Street signs are in both Arabic and Latin script. 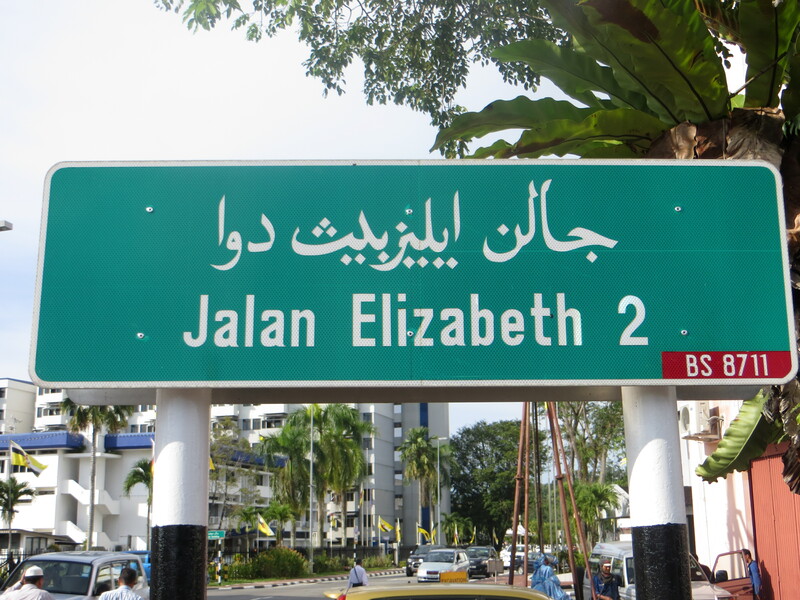 We were amused to note that they used Arabic instead of Roman numerals for Elizabeth II Street, even though Arabic doesn’t use Arabic numerals…. For us the most distinctive feature, though, is the fact that alcohol sales are banned under law. Egads! Fortunately you can bring a limited amount into the country, and the restaurant in our hotel allowed us to bring wine into the restaurant. (Interestingly they wouldn’t open the bottle themselves, nor did they charge a corkage fee, but they did bring us a a corkscrew.) 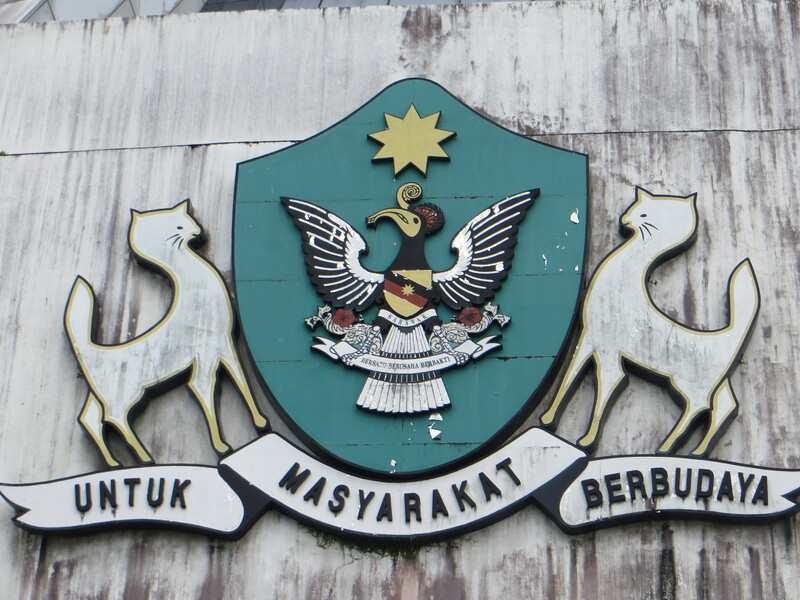 As you might imagine, the absence of alcohol is probably related to an almost total lack of any nightlife or excitement in Bandar Seri Begawan, the capital and only city of consequence in the country. Oh yeah, one other notable feature: male homosexuality is punishable by up to 10 years in prison. There are, however, no restrictions on female homosexuality. Strange place. 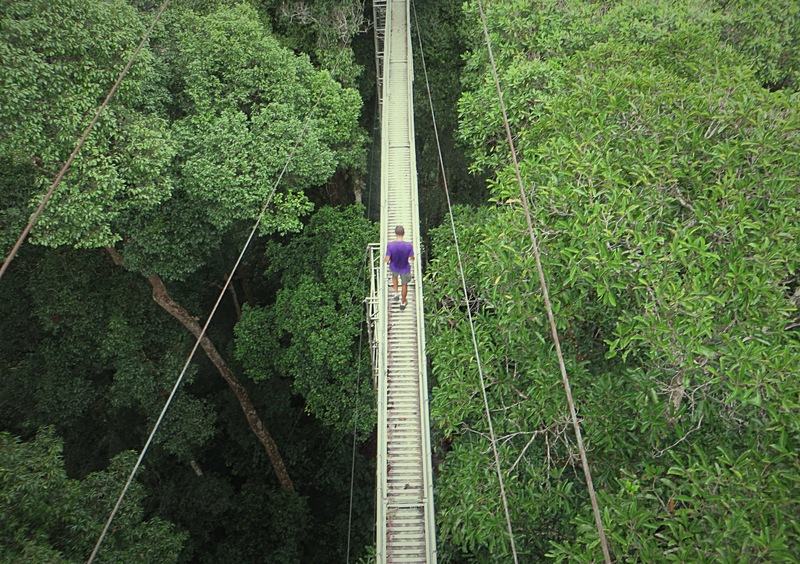 The highlight of our brief two-day stop was a trip to Ulu Temburong National Park. Of the 210 square miles of the park, less than one square mile is open to tourists; the rest is reserved for scientific research. That tiny sliver, though, was pretty cool. 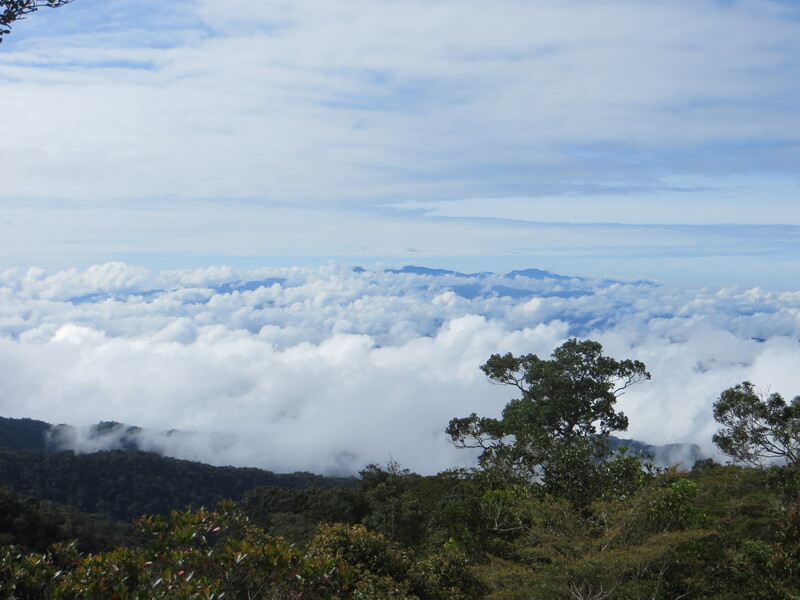 In this case the journey is a big part of the joy – most of the trip is on a couple different boats up rivers in the middle of gorgeous rain forest. Then the main activity inside the park is an aluminum walkway through the jungle canopy. The views were amazing but I can assure you it’s not for those with a fear of heights. You’re way up there – nearly 200 feet above the forest floor – and you can feel the towers and walkway swaying. Lots and lots of steps to get there, but totally worth it. 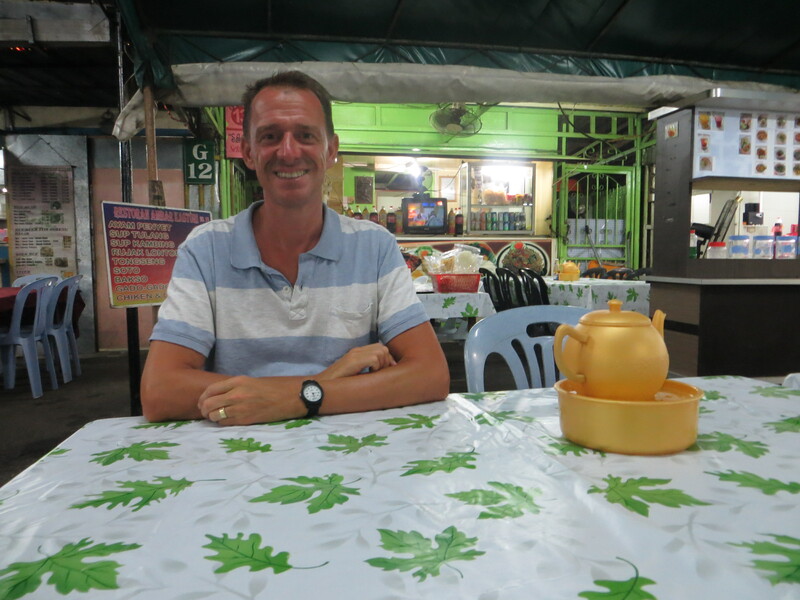 We don’t usually eat at hawker stalls, but since we weren’t going to get wine with our first dinner anywhere, we ate here. For the two of us the chicken and gado gado came to $12. And it was good! 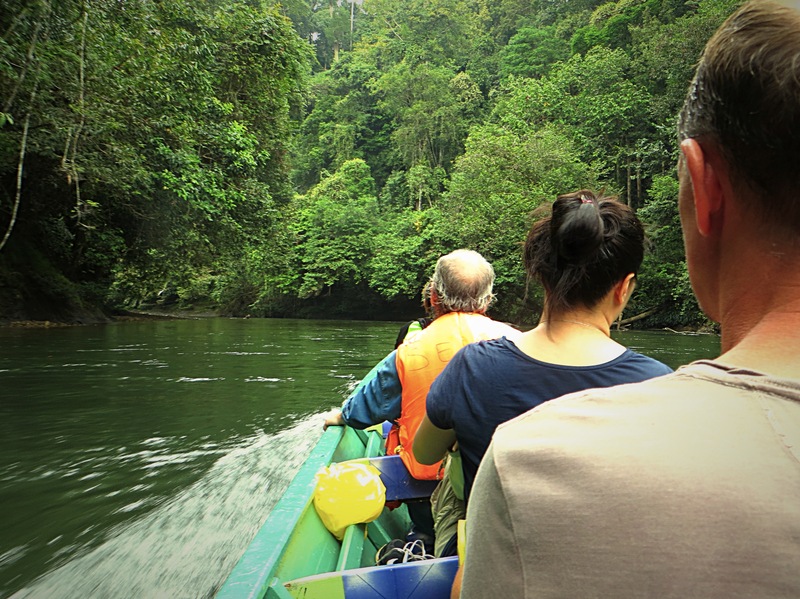 The final boat trip to Ulu Temburong National Park. In front of Mark is Ki, a Portland, OR, native teaching English in Korea. In front of her is a Frenchman for whom personal hygiene was distinctly not a priority. Yuck! Jim on part of the aluminum walkway. Mark took this from atop one of the towers. 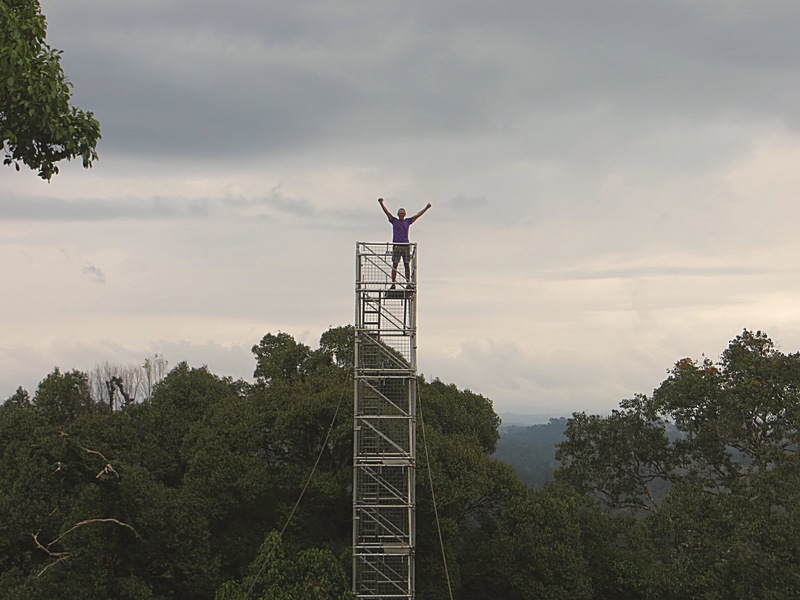 Jim atop one of the towers. Definitely feeling on top of the world. We intended to stay in Kuching for three days but extended to five. 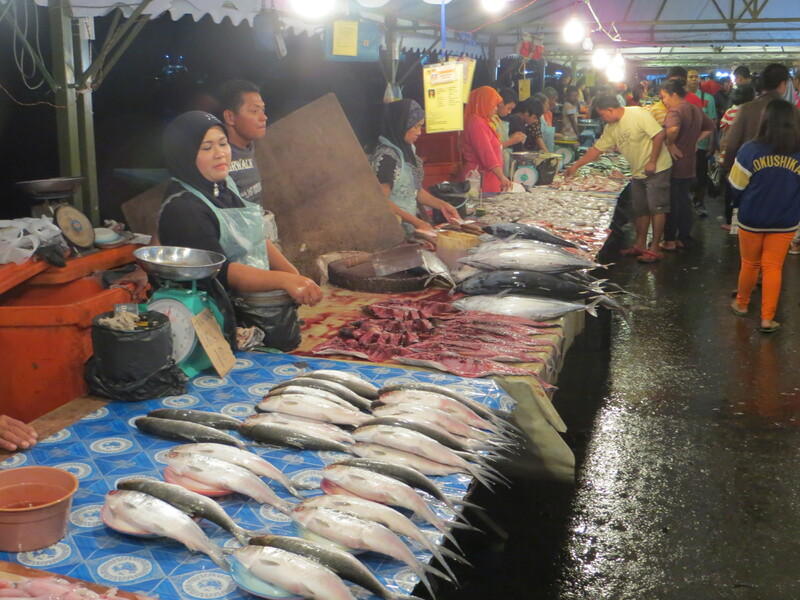 We just loved the combination of adventure activities and nice urban nightlife — to say nothing of the fact that Kuching is known as “The Cat City” and even features its own Cat Museum. So kitsch is what we intended to see, and kitsch is what we got. 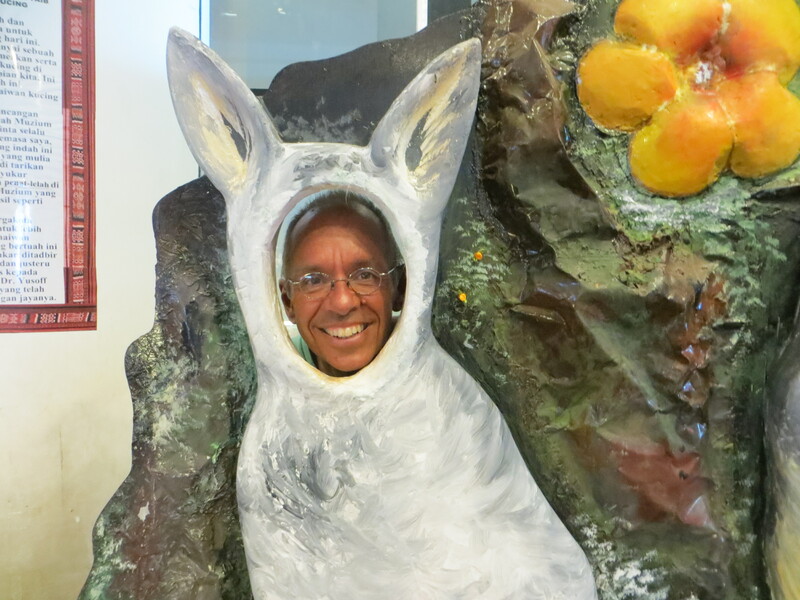 I had feared that they’d try to sneak in some kind of “legitimate” exhibits about cats — maybe something about different types of cats or how cats adapt to different geographies. But I needn’t have feared anything like that. In fact, the use of the work “museum” was a pretty big stretch. 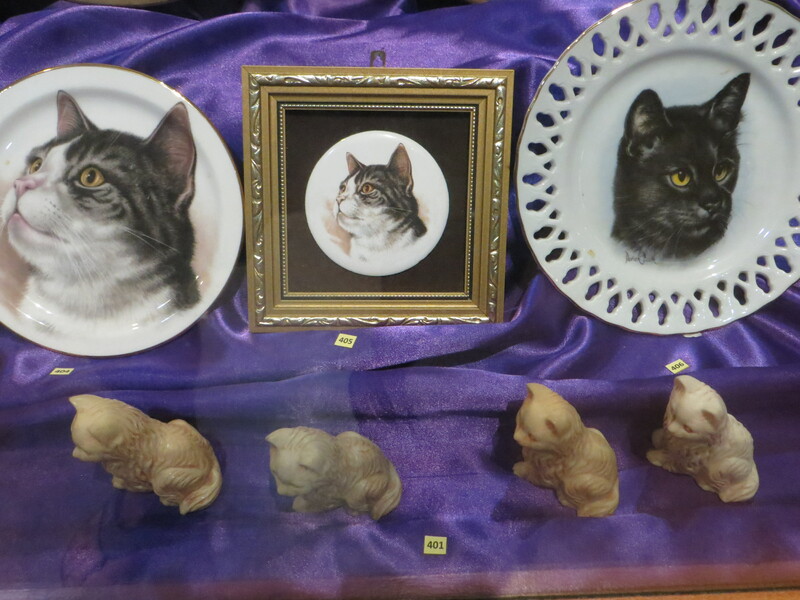 It was more like a big collection of random cat junk — cat figurines, movie posters that feature cats, cat plates, cat posters. 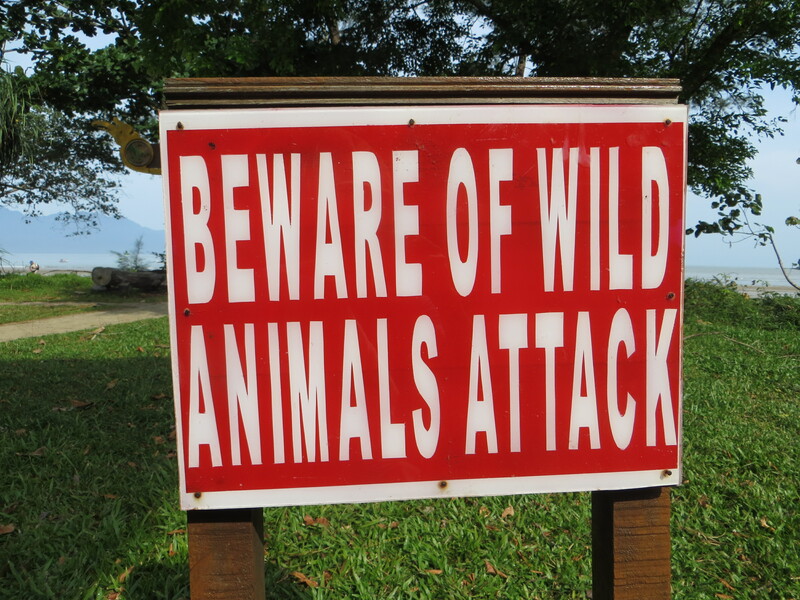 A warning before we hit the trail at Bako National Park. I learned what it was about toward the end of the day as I was sipping water and chatting with a Danish friend as she ate a late lunch, when suddenly a monkey pounced on the table and decimated her lunch. Of course it was organized into thematic sections like “Cats in Movies” (the movie posters), “Cat Naps” (pictures of cute felines napping), and even “Cat Food” (random packages of cat food). “Cats in Cards” included a wall covered in greeting cards and postcards that feature cats, along with a description of how millions of cards with cats crisscross the globe every year. 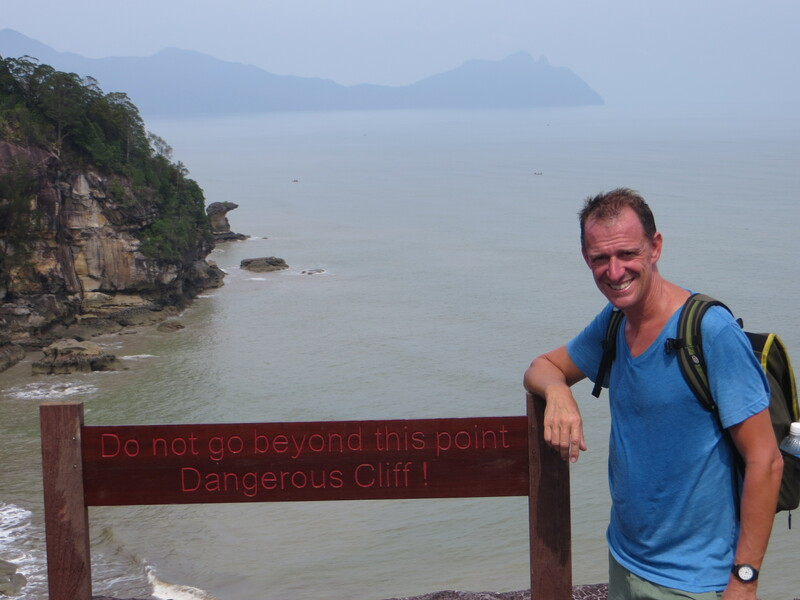 Having hit our limit of cultural intake at the Cat Museum, we spent our final day in Kuching at the beautiful Bako National Park just outside town, where a hot, humid, strenuous hike rewarded us with a stunning beach. 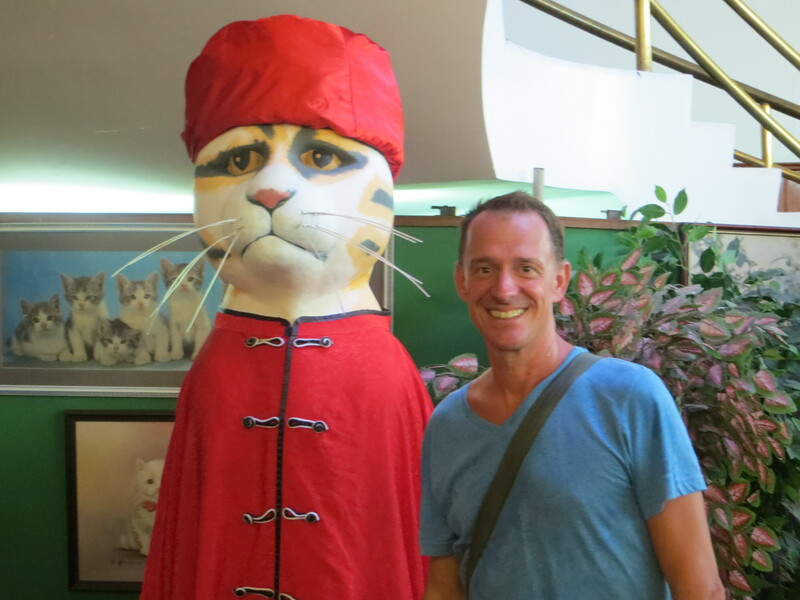 Then we caught a flight to Bandar Seri Bagawan, the capital of the Sultanate of Brunei, which we will report on next.